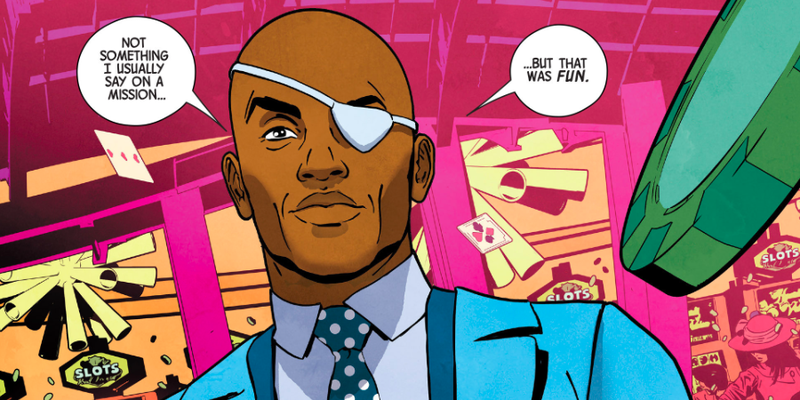 Nick Fury Jr., the biracial son of the original Nick Fury, has always been blessed with his father’s superhuman slow-aging and Samuel L. Jackson’s good looks. In his brand-new ongoing series written by James Robinson and penciled by ACO, though, the younger Fury does something that neither of his “fathers” has managed to do: give us a story about a black James Bond. Most of Fury Jr.’s adventures up to this point have read a lot like a logical translation of the things his counterpart in the Marvel Cinematic Universe would likely get up to in his time apart from the Avengers. Infiltrate a Hydra cell on Monday, intercept a cache of illegal alien weapons on Tuesday. In a particularly memorable one-shot, Fury Jr. traveled back in time to 1965, met his dad as a young man, and ended up saving a young Barry Obama from white supremacists. But now Fury Jr. has his own self-titled series (whose first issue came out yesterday) and his first assignment isn’t quite as fantastical as time traveling. Instead, it’s a modern-day throwback to the golden age of spy movies where camp and vibrant style were still a part of what it meant to be a super spy. Fury’s mission takes him to a casino on the French Riviera where he’s meant to find Auric Goodfellow, a man with financial ties to Hydra (a not even slightly subtle nod to Bond villain Auric Goldfinger). There’s action, there’s humor, everything is beautiful, and compared to the rest of Marvel’s universe—just now getting pulled into another dark, overwrought, universe-changing event—Nick Fury reads like a breath of fresh air. Its story is tight and nimble, and ACO’s bold pencils and the lush palette that colorist Richelle Rosenberg uses to bring the book to life makes the art sharp and kinetic in a way that makes it straight-up fun to run your eyes over repeatedly. Personally, I couldn’t shake the feeling that this issue alone could be used as the basis for a solid James Bond movie featuring a black lead. For as long as there’s been a push from fans for a non-white Bond, the specter of Bond’s canonical whiteness has loomed large, exerting influence over how studios have handled the character. As GQ pointed out in a 2015 discussion about why Idris Elba hasn’t been Bond yet, the ultimate payoff in movies like Live and Let Die comes specifically from Bond making his way through very black ‘70s Harlem and ultimately emerging as a white hero. It’s Bond’s legacy of whiteness, you could say, that’s made it so difficult for many people to even conceptualize of what a contemporary Bond of color might look like. Nick Fury #1 just made that a hell of a lot easier to do. Just look through the book. Everything from Fury’s multifunction eyepatch that he uses to fake retinal scans to the series of one-liners that he exchanges with a Hydra agent mid-boat chase oozes classic spy-thriller. This comic is a proof positive that whenever the current battle over the rights to the next handful of Bond films is finally over, whoever’s in control should know there are definitely new directions to steer the franchise in. Nick Fury #1 may not translate exactly into a finished movie script, but it definitely works as a story treatment. And it comes with its own concept art, too.